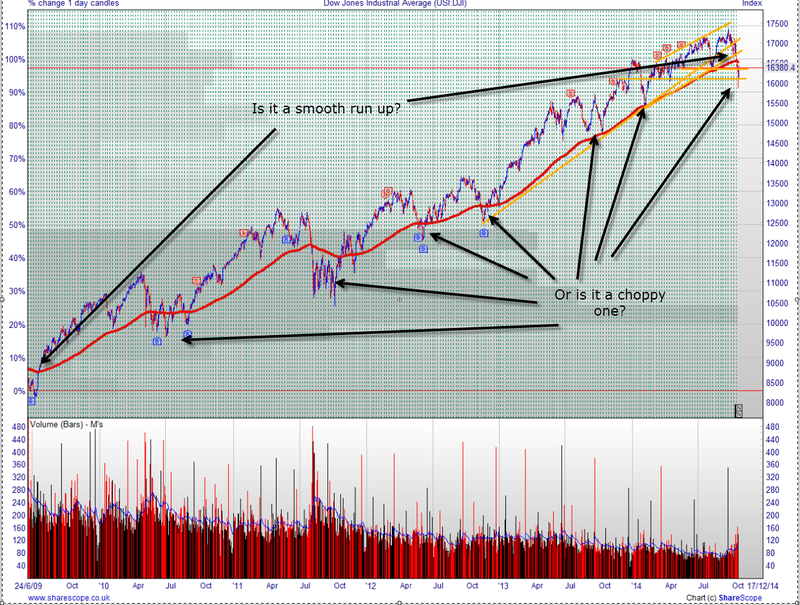 I hope to publish three or four posts per week to record my thoughts about the market. I will use broad brush strokes to describe my activities, but nothing I write should be construed as a recommendation. I will highlight my fears and uncertainties because that is what stockmarket trading is about. Comments are invited to help me and readers better understand what is happening. The winter bugs return and oil prices slide - who wins who loses? With Brent Crude prices at $73 we can see that only three areas are not already in serious trouble: the Middle East which is mainly Saudi Arabia and the Gulf States; the former Soviet Union and Russia; and Central and South America. Even some oil producers with low extraction costs are in trouble because their national budgets have been set on the assumption that they will be earning high excess revenues from good oil prices. Russia is included in this group of countries vulnerable to the effect of low oil prices. In 2010 46% of the government's revenues came from oil. 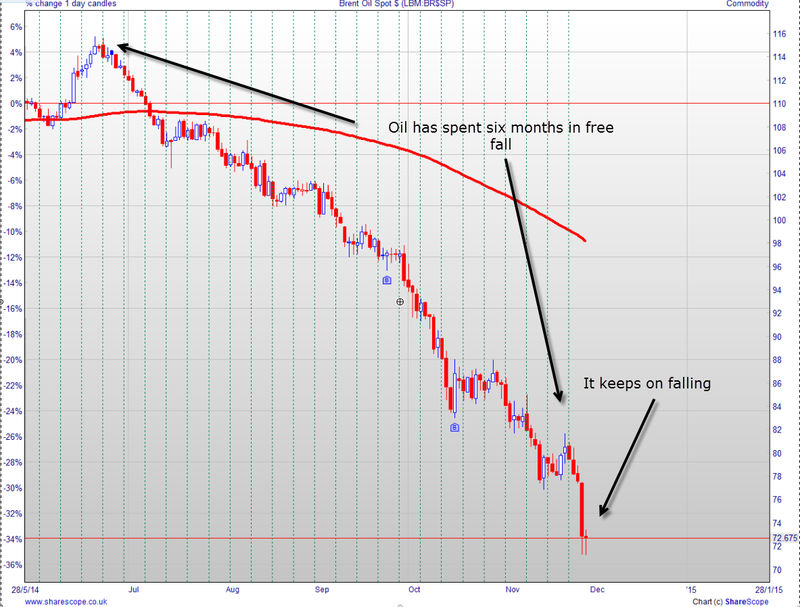 The 40% fall in oil prices in the past six months will have had a devastating effect. The strategy of driving down prices by the oil producers' big guns has a terrific logic. They have allowed their competitors to spend on research and development, almost always, funded by government subsidies only to come in at a crucial moment and show who really is boss: cheap oil. Just wait. The climate change warriors will be shut out of the debate on future energy because the cost differential between their pet projects and cheap oil will be too great. No more wind farms, and the scourge of ugly solar panel will be over. On the plus side cheap oil will help to keep the battered economies of the west afloat and China's cost base will be lowered. With luck the stock market will be buoyed by this unexpected cost saving bonus - better ditch those oil shares, especially exploration companies, and pile into aviation stocks. As an aside for my American readers I would like you to know that the treatment I received at the hands of my doctor was prompt and delivered partly by phone and partly in the doctor's surgery by a qualified practice nurse who was warm, caring and conscientious. I did not have to pay a penny for the service or for the medication. It had been prepaid by my lifetime of paying taxes. And my contributions go to providing equally good services everyone who needs them. This high quality of care costs us just 9.4% of our GDP in the UK. In the US you guys spend 17.9% of your GDP on health and according to Gallup over 13% of adults remain uninsured. It's hard to measure outcomes of healthcare spending but a crude measure is life expectancy which is 80.4 in the UK and 78.9 in the US. I think we get a better bang for our buck. The US market continues to make new highs. QE is ended but interest rates remain low and the central bank suggests that they will continue low. Oil prices continue to fall and are now at levels not seen since 2010. The US economy continues to improve. All in all the situation appears to be set fair. It is also the time of year when stock markets, on average, do best. The UK market has been doing well for a month but needs another 300 pints to break through its previous highs. So, can we relax? I am fully invested but far from relaxed. I feel the need to make hay while the sun shines but I am watching the sky for the appearance of dark clouds. To create my selection of UK shares I have reworked my analysis of the best Vector Vest Unisearches. My selection is a combination of standard searches, adaptations of the standard ones and ones that I have developed myself. I tested for the period November 1st to April 5th for each of the years 2008 to 2013. In those years, on average, the index moved up on average by 3.7% over that winter period. My shortlist of unisearches rose by between 5.5 and 26.5%. The standard unisearches that I tested were Southern Comfort UK which achieved 15.9%, SuperStars which made 15.8% and Hidden Gems which made 15.3%. Clear winners were, however, adaptations of Southern Comfort and SuperStars where I added conditions that picked shares that already showed significant momentum. These two searches yielded back-test performance over the past five years of 26.5% and 21%. The shares I picked using these tests are IAG, EMG, PHD, FLYB, INL, LMP, and TSTL. All, with the exception of LMP are proving winners with an average rise of 2.5% in the space of about a week. I have had a torrid time with my US shares. I have had to pull out with serious losses from attempted campaigns in mid September and early and late October. No fun at all! I have gone for US shares purchased using unisearches that have done well in tests for the November to April periods in the past six years. These are Jail Break - No Contra ETFs, AC's Percent Price Poppers - RT Asc, Blyar's Bottom Feeders/BMB, Russell 2000/RT, Rob's Raiders, S&P500 - Stop ASC all of which have yielded on average well over 30% returns. 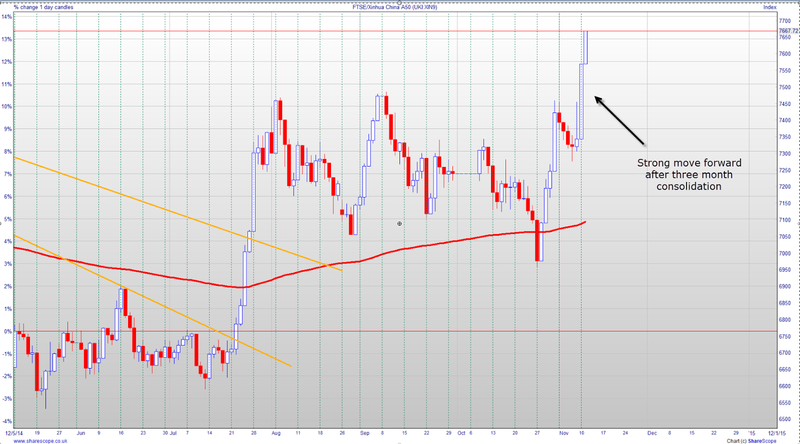 Even better was an adaptation of The Comeback Kids but this generates lists of very risky shares.. I hope that this time my timing is right. I also wonder whether I should revisit Chinese shares in the US market since the Chinese stocks seem to have staged a major break out. So that is where I am now. I hope my instinct for believing in a good winter to spring period will stand me in good stead. I need some luck. A couple of years ago I wrote a few short stories and I have decided to publish them. 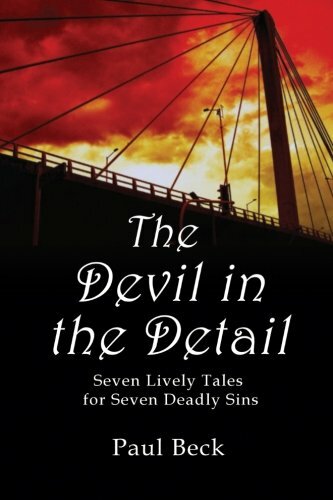 If you are interested they are available on Amazon under the title The Devil in the Detail. Seven modern fables based on the seven deadly sins. Institutions intended to protect us often become instruments of oppression. Power wielded without sensitivity can wreck lives. Or 'at last' as we say in English. Yesterday came the announcement that QE in the US is to be retired. The market took the news in its stride since it was well anticipated. The announcement came with the promise that interest rates would remain low. This was designed to avoid panic as the tap pouring out cheap money was turned off. There was, however, a change in the FOMC's view of another important indicator. They said that "underutilisation of labour resources is gradually diminishing". This is code for "there may soon be a shortage of labour and wages may begin to rise". So what we have here is the first admission that the specter of inflation may be poised to reappear. At present the commodity markets are benign. Oil prices in particular are low. In a list of unleveraged commodity exchange traded funds (ETFs) only 16 out of 70 are up on a year ago and of those 6 are concentrated on the livestock industry. Others that have risen include coffee, zinc, cocoa and nickel. 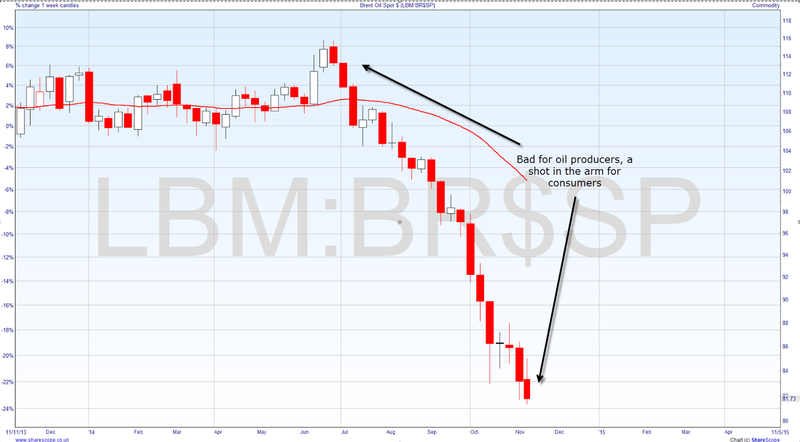 The big losers include sugar, wheat, other grains, precious metals and most importantly of all oil and its derivatives. The low prices of these important staples means that we are currently living abnormally cheaply. Any change in this benign situation, together with potential wage inflation could lead to inflation, a rise in interest rates and that would be the end of our bull market for sure. All credit must be given to the central bankers for inventing QE. As a method of keeping a financial system, that had driven itself onto the rocks, from sinking beneath the waves it has performed superbly. Naysayers, and I include myself, have been proved wrong. The system did work and the UK which used the same strategy now has one of the healthiest economies in the West. The Euro Zone is embarking on its own version of QE. We still don't know if the world economy will survive without the crutch of QE which transferred such huge sums of money from the state sector to private businesses and pushed the stock market to record levels. What we can be sure of is that the flow of money which found its way into the world's market has now been switched off. The supply/demand balance has been changed: no new money no new demand. From now on we must listen even more carefully to statements by the World's central banks to see what they plan to do to keep the vehicle on the road. 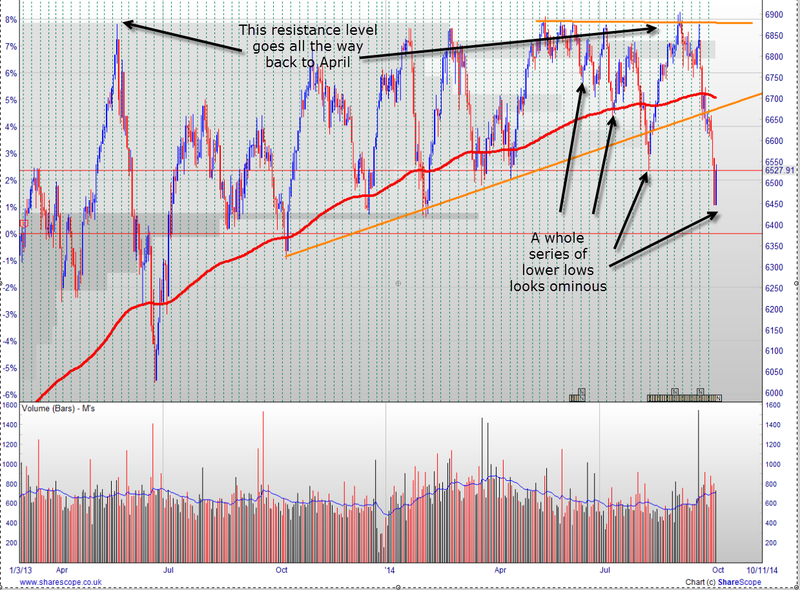 I continue to be impressed at how well those support and resistance lines work. Just look at the chart. 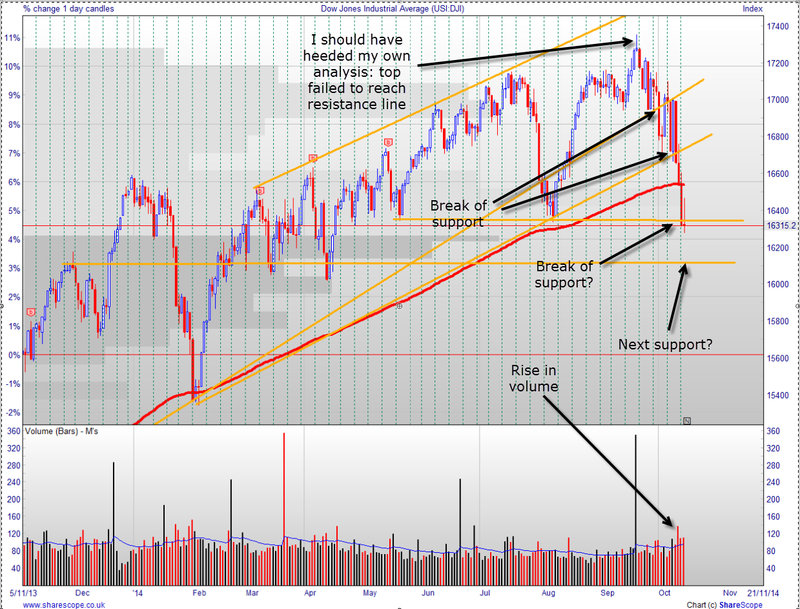 I'm not cheating, I drew that line last Wednesday as higher levels of support gave way. 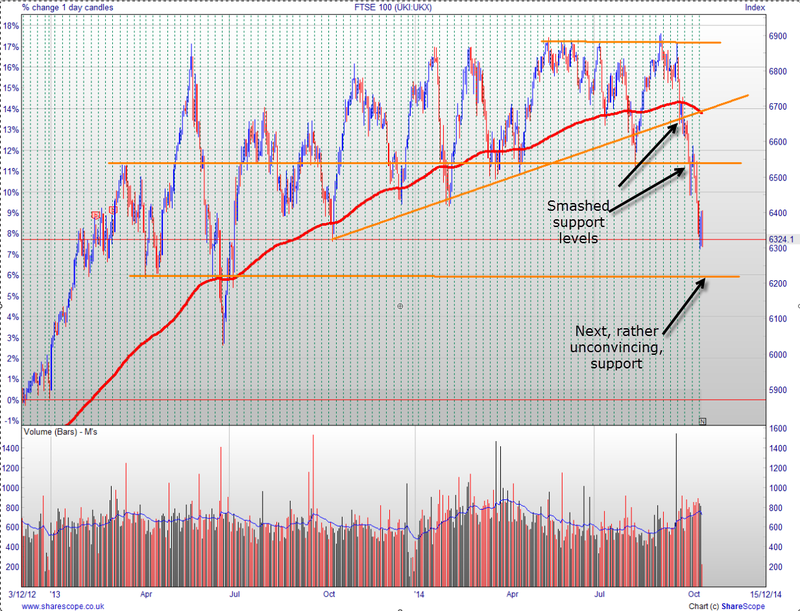 Intra-day the level was pierced but by the end of the day the market rallied to settle on that support line. And then on Friday the rockets fired and we were on strong positive territory. I placed support at around 16111 based on resistance encountered last November which turned into support that held the market twice in March and once in April.And that turned out to be where the market turned this time round. 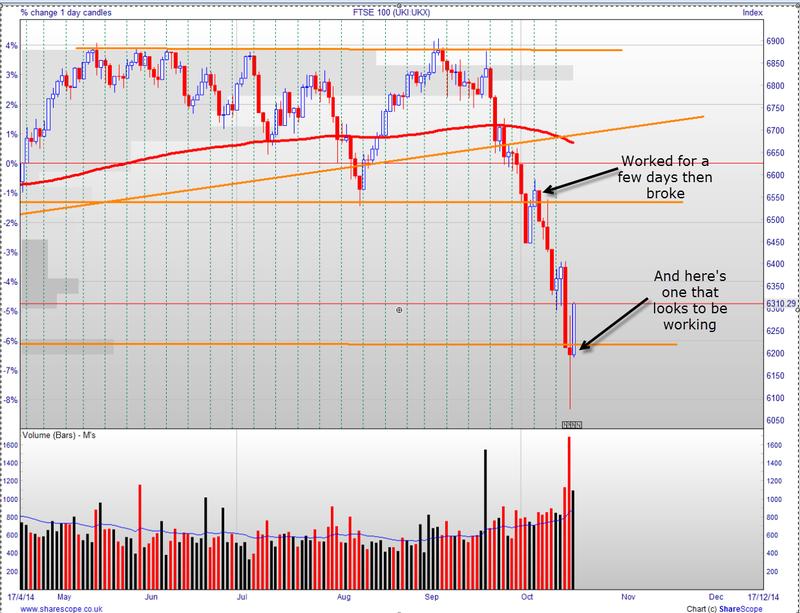 I got it right with the FTSE too picking a support level around 6200. I described it as 'unconvincing' since it was based on just three previous support points back in April, none of which looked significant. As it turned out, that level held too and it looks as though today we'll see some follow through from Friday's upward thrust. The analysis method works well, it seems. But the big problem is how to turn theory into practice. Often I do not have the courage to believe my predictions and to trade in anticipation. Occasionally I do and I pick my moment badly and the turn I expect does not happen. Burnt fingers. 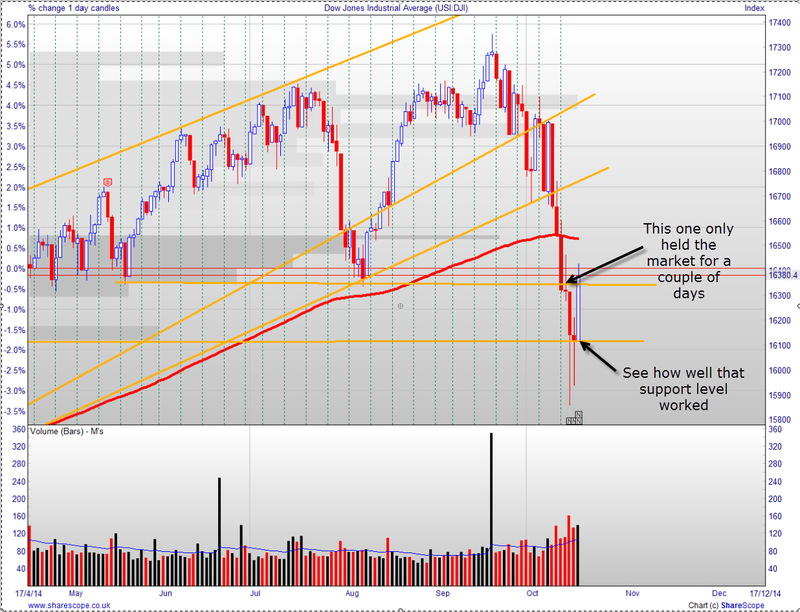 So then I see a potential turn and wait for confirmation. Result I am too late to the party and fingers get burnt again. Trading in a choppy market is no fun. Oh for a nice smooth trend like the one I was too fearful to join that has dominated the US market for the past two, or is it five years. I have managed to pick bits of it successfully but not nearly enough to make for a happy life. Too early to say whether this is a correction or the start of the fall that is bound to come, The free money fest provided by QE and long term low interest rates will end eventually . When it does there will be a big reevaluation of stock prices. Is that happening now? Still hard to tell. 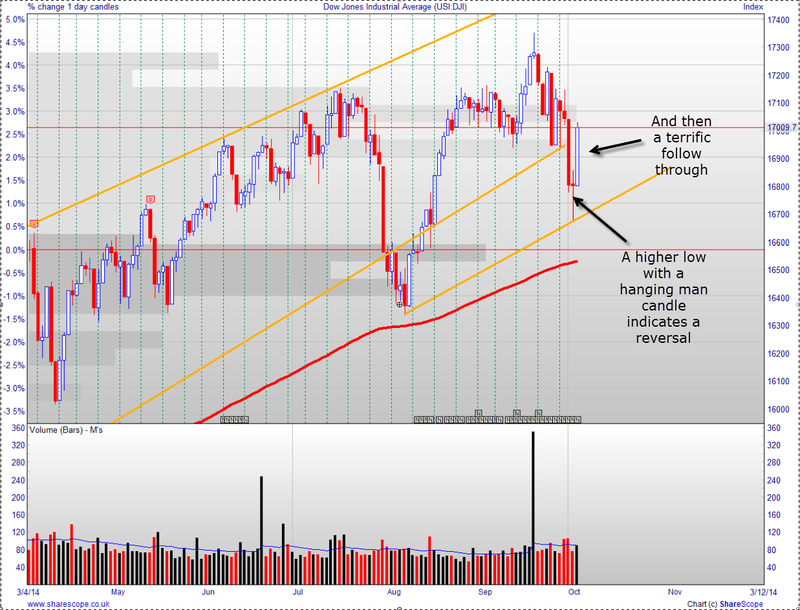 What is interesting is that the support lines which I identified and put on yesterday's charts are holding the market slide for now. Watch out if they are broken. I jumped the gun and am now in deep water. What now for the DOW and the FTSE? Tough blog to write this one. I have been unwell and out of action for a few days. Nothing to do with the pea and and mint pasta I hasten to add. When I am unwell I find it hard to make decisions. Instead I let things ride. This was the wrong moment to do that. At the beginning of last week I had the impression that the pull back in markets, which had been running for a couple of weeks, would be short lived. No harm in that but my mistake was to jump into the market in anticipation of a rise instead of waiting for confirmation that the the recovery had begun. I held on, fell ill and the rest is history. I finally pulled out yesterday, nursing some nasty wounds. Have I pulled out just as the market was about to turn? It looked as though I had as the market spiked upwards during the day. But by the end it had pulled right back and I was glad I had decided to bite the bullet. Obviously an earlier exit would have been better but there is no point in wishing for something you failed to do. by the time it is a good idea to return to the market there may be better opportunities and you can recover your losses faster by buying faster moving shares. So that's where I am now. Next question: What does come next? What now for the Dow? The Dow has pulled back 6% since its high on 19th September. 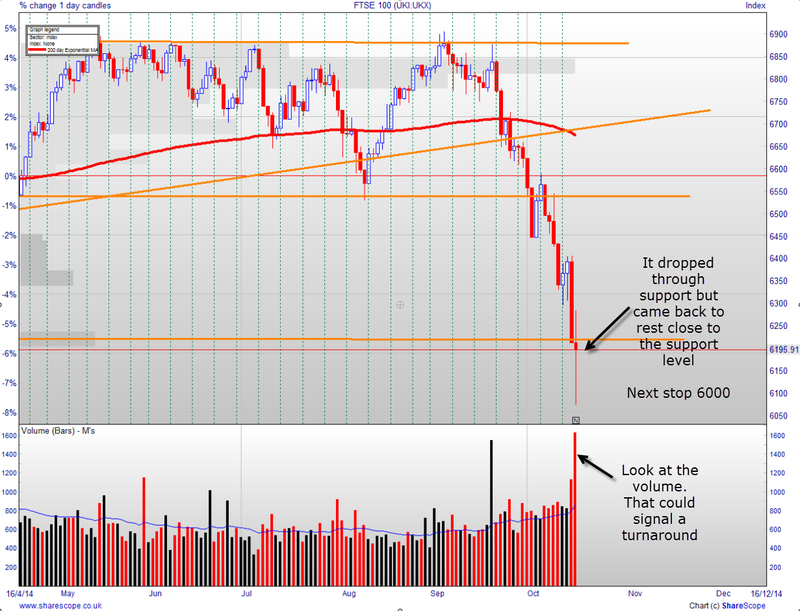 Its biggest fall was 340 points on 9th October but there were several other big down days. There were also 4 recovery days early on, so during the early part of the slide there was definitely a battle between the bulls and the bears. The bears are starting to have it all their own way on modestly rising volumes. 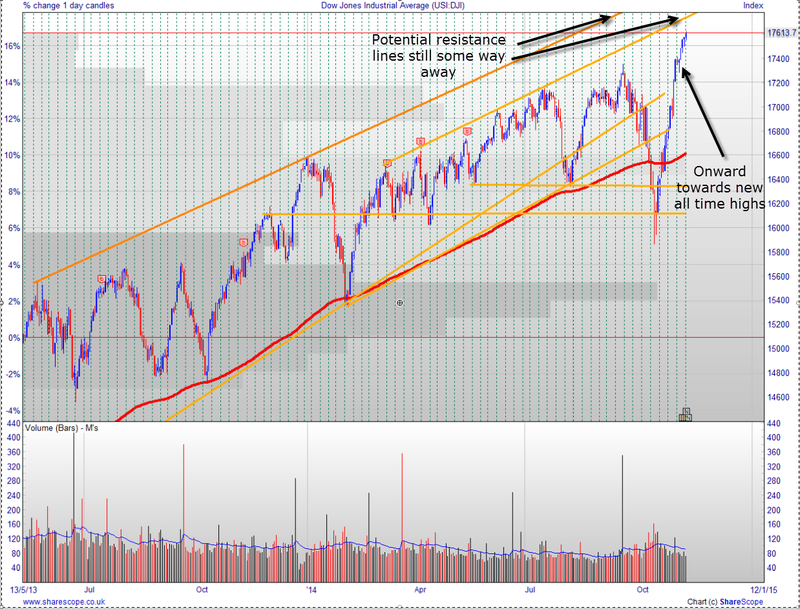 The other worrying factor is that two diagonal support lines have been smashed and a horizontal has just been broken. 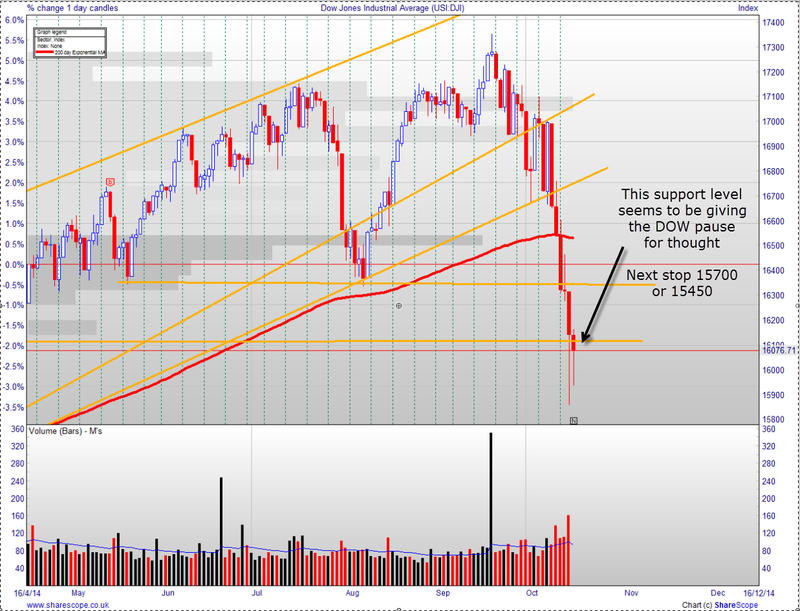 If we see no recovery now the next support is 200 points away at 16111. And what of the FTSE? The FTSE has fallen by 8.5% since the high on 4th September. Why so much? After all the UK economy is leading the world in its recovery. That is one of the big stock market paradoxes. Strong economy leads to weakening share prices. It is not such a mystery when you take into account the fact that interest rates affect share prices. Higher interest rates, or threat thereof, mean that the returns offered by shares are reduced in RELATIVE value. If you can get a better return from risk freeish bank accounts why take the risk of holding shares? So the FTSE's slide has been accelerated by the threat that a recovering economy will allow the Bank of England to raise interest rates. This explanation has been dealt a blow by the lower than expected inflation rate announced yesterday. But we are still in frightening territory. It looks as though that last pull back was rather short lived. What we do have is a rather strong signal that our most recent low was higher than the previous one and that we could have a new buying opportunity. Hard to say how long it will last. It is likely to make a new high though. The fact that I pulled out of my US shares does not worry me at all. The costs of trading in the US are low since there is no stamp duty to pay. Broker's fees are low too and spreads are minimal. 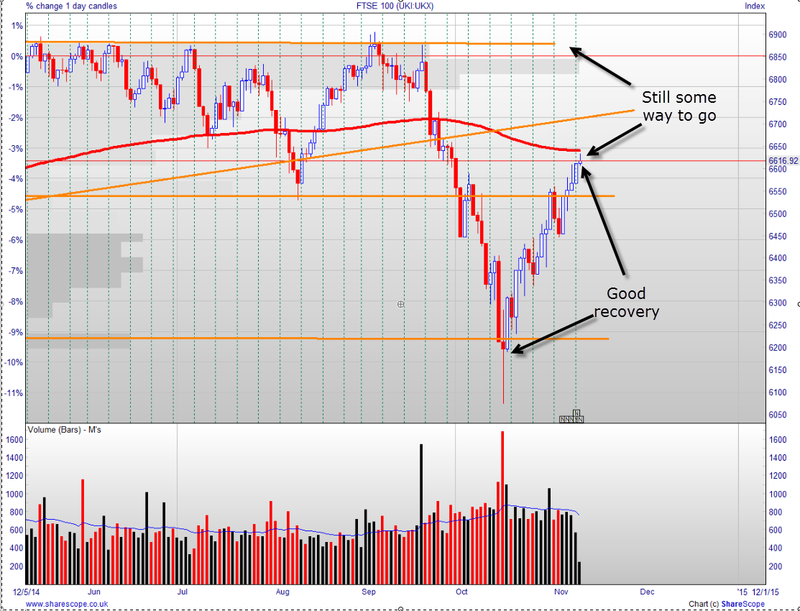 I'm going to be looking for shares that were beaten down in the last pull back and are due for a nice rebound. I could be buying from this afternoon onward and expect to be fully invested by Wednesday. I suspect I need to move fast because this rally may be short lived and I will be taking my profits even more quickly than I did in the last rally. This time I will be grabbing the money as it comes and will not be waiting for the inevitable pull back. I have held onto more of my UK shares since they have been doing better. But I still have some cash in that portfolio which I will reinvest. I'll let you know what I have bought and when. Another great vegetarian recipe for four people. Use 350 gms any type of pasta shape that takes your fancy and cook as per the timing recommended on the packet. Add 200 gms of frozen peas per for the last minute of cooking. In the mean time prepare the sauce. Blend about 200 gms of crème fraîche, 300gms of thawed peas, 100 gms grated mature cheddar, the leaves from a bunch of mint and salt. Blend until smooth. When the pasta and peas are cooked scoop out a mug-full of the cooking water, drain the pasta and return to the pan. Add the sauce and add the reserved water to achieve the consistency you like. Mix thoroughly and serve. Try following links shown in pale blue. I have been trading for twelve years and have made an average return of 17% on the capital invested each year. I want to do better and decided that a log of my thoughts and actions would help indentify successes and failures. If you feel you can help please post comments. I do not recommend anything but hope you will find my observations interesting.